Did you watch the Oscar's on TV? In our house it is a big event. Irv hands out ballots and everyone chooses their favourites to win. J.J. is writing down my answers for me. I don't watch all the movies so I use a deck of cards to pick my winners. here for a whole week of enjoyment. The winner this year with 7 correct was Irv. Laryssa and I both used the card method to make our selections and we got 5 right. You might also be wondering why I didn't blog this after the Oscar's. That would be because I fell asleep during the show. Oops! An interesting fact: I NEVER fall asleep while I'm crafting. projects but the best part is chatting with everyone and sharing tips and tricks. far right that holds up the pattern or layout idea that you are working from. attached and hold your brads or buttons. To the left of that is a mini clipboard. I totally love mini anything. Too Cute!!!! I'm dying. It's just the perfect thing for taking to crops. To the left of the mini clipboard is some more clips and things. In the base of the suitcase it a tension curtain rod holding ribbon spools. cases with all my Stampin' Up! goodies. 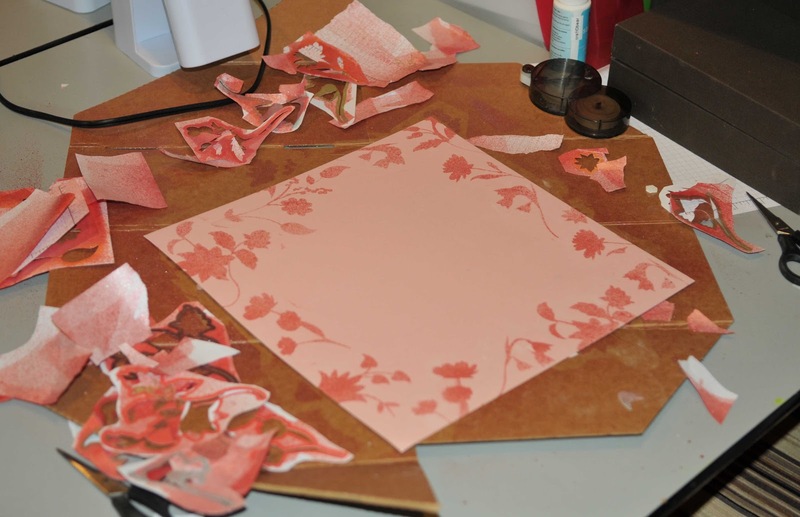 I have been invited to set up my Stampin' Up! table at a crop tomorrow. from family. They won't have to cook or clean all day. Each one of them will receive this lovely treat tube filled with skittles. magazine that is just one of my many perks for being a demonstrator. card. I am looking forward to tonight when 8 of us get together and swap boxes. 7 cards finished. 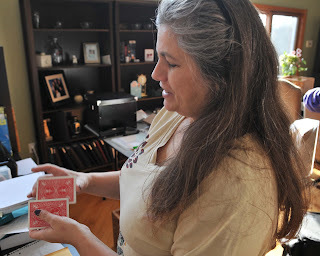 I will show the cards here on my blog tomorrow. Another square card. I myself hate cherries but I think they look yummy. 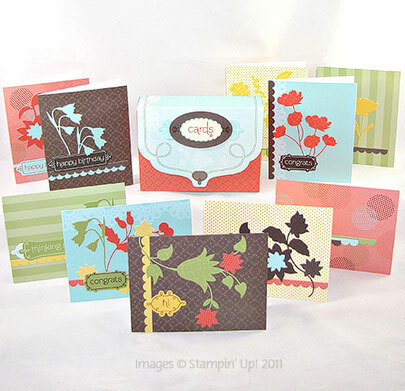 You will find this stamp set and this fabulous Designer Series Paper in the current mini. This card was made for a colour challenge that I participated in. 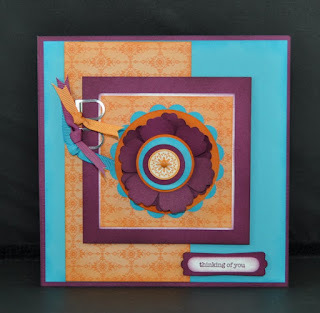 Just another one of the fabulous perks for being a demonstrator on my team is belonging to exclusive site where they inspire you and show you their creations. 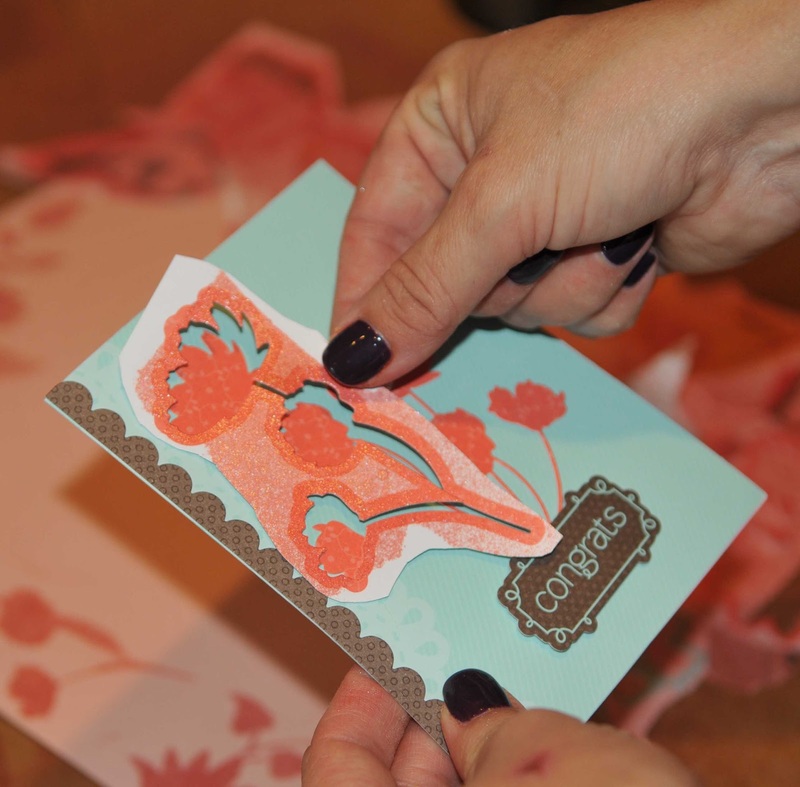 All the participants in this challenge are making cards using three colours. Tempting Turquoise, Rich Razzleberry and Pumpkin Pie. Why don't you give these three colours a try. I would love to see what you come up with. humour, is very hardworking and enjoys music, computers and movies. I chose to make his birthday card using just Basic Black and Very Vanilla. 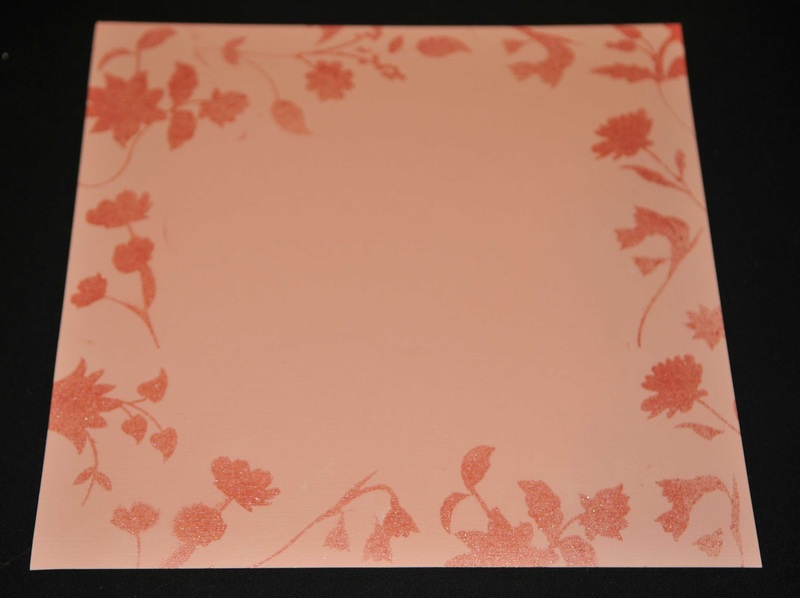 I also used just Black Stazon Ink and Black embossing powder. bargain I have ever bought since I use it so often. and creating. You can bring whatever projects you would like to work on. all meals are provided and you don't have to do any cooking or do any dishes. and then incorporate it in your next project. are missing out on knowing the most incredible woman ever. She is so loving, generous and kind. But most of all, she is a HOOT!!!! Mom emails me some crazy things and she emails Irv even crazier things. see what your Mom sent me today"
This is one of the things she sent me that I do think is very cute. And a friend like me?? that's just a sign of good taste!! We'll be friends until we are old and senile. Then we'll be new friends. edited it out. So, Mom that will be 10cents please. Love you, miss you and see you in April. A little off the diet. That's for sure. Irv sure spoiled me yesterday for Valentine's Day. He came home from work early and swept me away to Niagara Falls. We rode the Ferris Wheel and went to the top of the Skylon Tower for dinner. and I mostly just ate the fruit. out on Valentine's Day but I was so wrong. The streets were empty in Niagara and it was a lovely time. 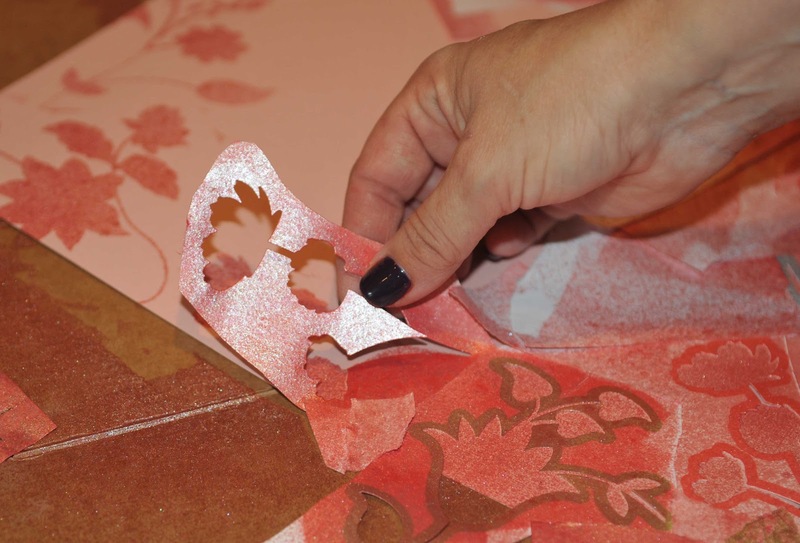 Today two lovely ladies, Kathryn and Donna, joined the craftDstamper's team. over $400 of product for only $150. I don't blame them. I would like to sign up all over again. or a FREE digital download each month for a whole year. SWEET! Now they can get a discount on all their future orders. Woohoo!! you all had a great Valentine's Day too. Last week I began my diet journey. We won't say how many times I have begun this event in my life. However, I am motivated and this week I am off to a great start. The official weigh in was done on the Wii and for those that have the Wii fit plus you know that it is does not give great words of encouragement. Instead, you get to watch the scale climb and then this little shocked voice says, "Oh my, that's obese." lol Then it makes your little character on the screen grow fat. My goal shall be to shrink that little character and myself in real life. I am going to record my weight loss journey in Stampin' Up! 's 5"x5" Art Journal. Pictured above you will see how I decorated the front of my journal. Whisper White Organza Ribbon - I tied a bow and then wrapped the White Twine with the Trinket Heart around the centre of the bow and attached to the front of the journal with a glue dot. The good news is that I will be able to enter that I am down 6 lbs this week. Woohoo!!! 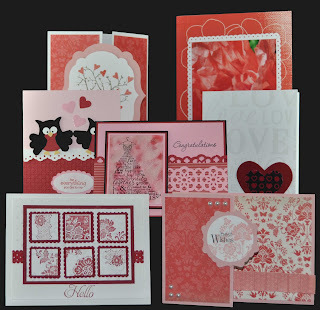 The Create & Keep Simply Sent Kit in the Occasions Mini makes 10 beautiful cards. After I was done making the cards there were all the outlines from the stickers that still looked gorgeous. I used baby powder to take the stick off the back of the sticker outlines so they are now stencils. 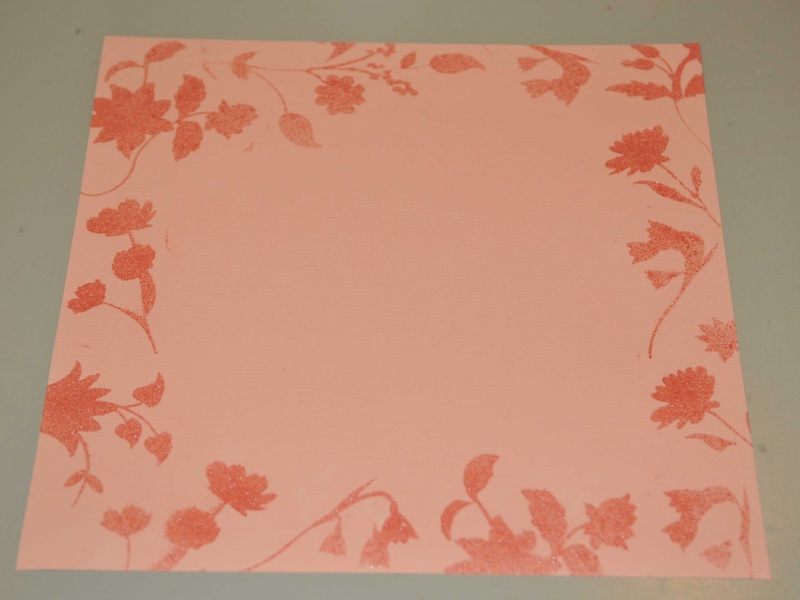 I placed the stencils around the outside of a 12 x 12 piece of cardstock. It doesn't look pretty at this point. Then I used one of my favourite products. I sprayed all over with Blushing Bride Smooch Spritz. It's like spraypaint for scrapbookers. It's totally fun. The cardboard was on the table to protect it but I still managed to spray the table too. Oops! 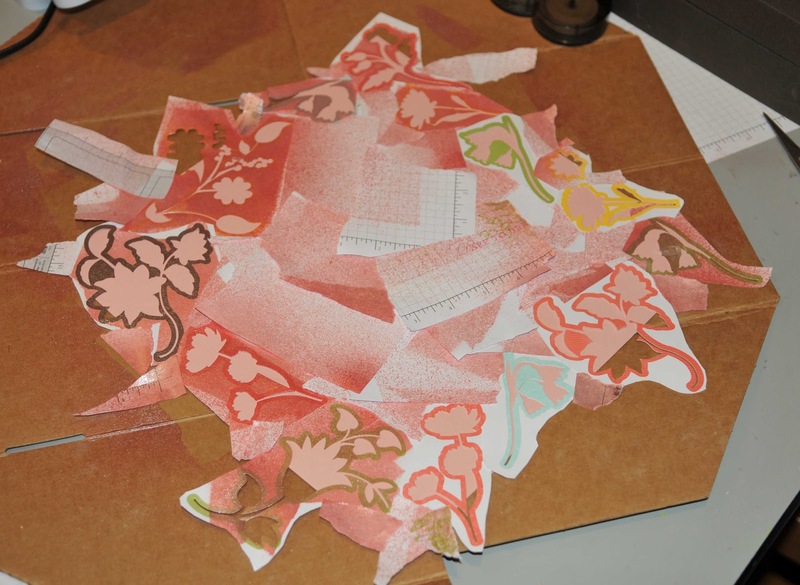 Then you peel the stencils all back off and see the cool results. Now I'm ready to add photos to my pretty background. 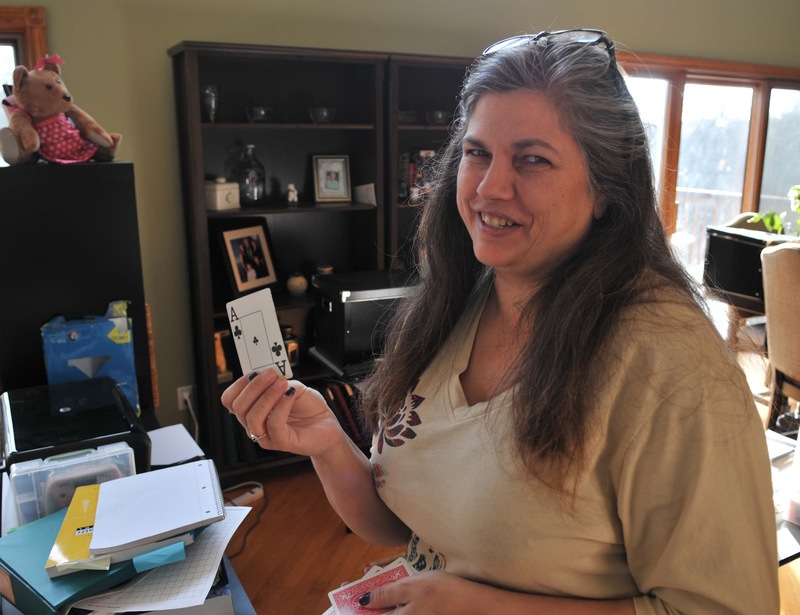 Diane and I headed to Kitchener today to do some research on booth space for shows and get some ideas. 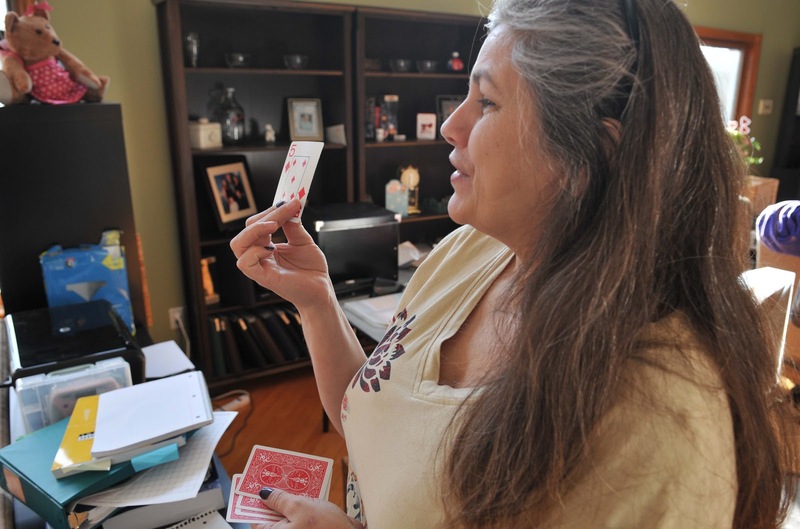 Of course the only way to gather research is to experience it firsthand. Jenny from Cowboys and Angels is roundin' up! the curls on Diane's hair. I definately had fun today and I have a few new ideas to add to my Stampin' Up! booth. Jenny did my hair , too. This is a slide from the big screen at Stampin' Up! Leadership Convention. I definately agree with this statement. creative counts then I'm the healthiest person alive. the more creative we will be. Do you like to send handmade cards? Are you watching your budget? If any of these are true, then this class is for you! 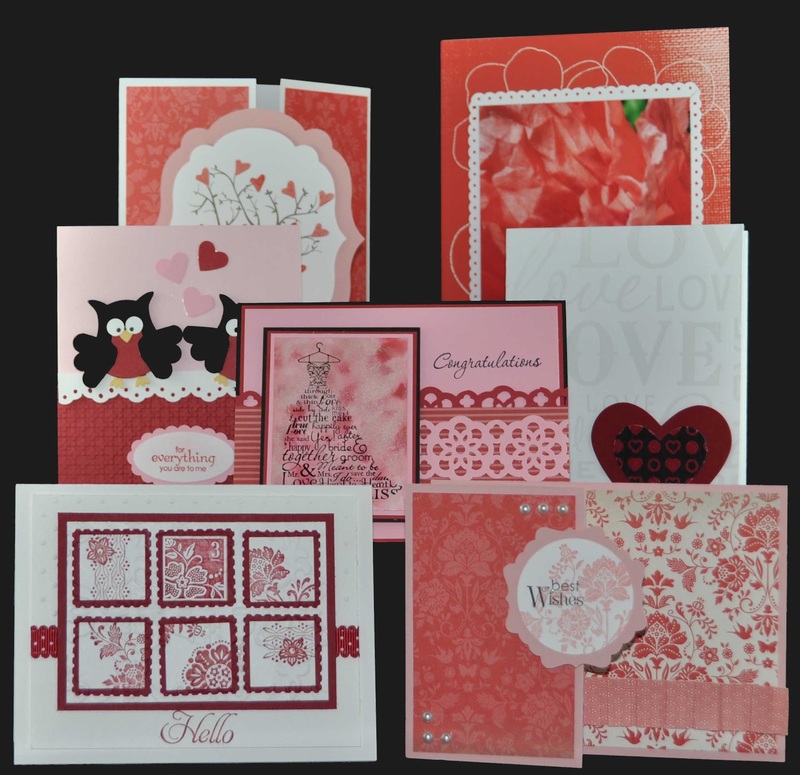 With the Create & Keep Simply Sent Card Kits you can enjoy the personal touch of handmade cards, even if you don’t have a lot of time. 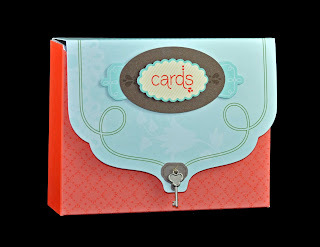 Join me and make 10 all-occasion cards in a coordinating box with dividers. You’ll be amazed how quickly you can create beautiful cards, and keep them organized in style for later! Contact me today at craftdbear@rogers.com to join the celebration! You won't want to miss this class because we will be adding some extra embellishments and features. For example this cute little key that you see pictured below. again. I have been searching for the motivation to shed some pounds. So my usual side of French Fries will have to be replaced with salad. So my husband and Stampin' Up! are the answer I was looking for. to visit them and feel comfortable walking around in a bathing suit. That's good motivation but Irv has added the best motivation. everytime I lose 10 pounds. Of course, if I gain a pound then I have to give Irv money. Ackkkkk!!!! So I am going to start a new little album to track my progress. 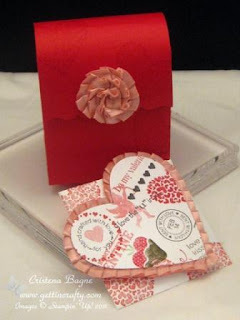 create a card using Valentine's colours but that wasn't a Valentine's card. 7 differentcards. It's always so exciting to see what other's have created. I think you will agree that these are all gorgeous. and every Tuesday Stampin' Up! releases new downloads. These are the ones from today. On this list is a retired favourite of mine, A Good Egg. I'm looking forward to playing with that especially with Easter coming. NO SEW projects I may have to keep the fabric for myself. Christena created for Inkspirations4u Paper Celebration 2012. I worked on several different projects and have many partially done. I didn't complete very much. The card above is the best of the batch for today. I tried the Polished Stone technique. The colours are Riding Hood Red, Pretty in Pink and Basic Black. I think it looks better in person than in the photo. That's not Irv's fault. nothing to do with Laryssa. No signs of any wedding bells yet. On a positive note, everyone is healthy and happy. That's the main thing. 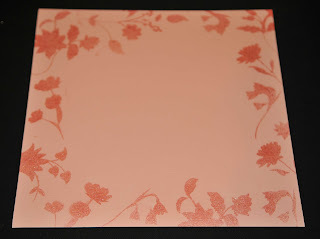 received at Stampin' Up! events. fabric once you see how easy it is to add to your cards. The card at the front right was at Leadership on a display shelf. classes. So here it is. Sadly I don't have many photos as I was enjoying the evening so much that I forgot to snap photos. We started the evening with our Business Development Program and Potluck Dinner. some new ideas to try and the food was yummy. Our team meeting was next on the agenda. Margaret was our meet 'n' greet hostess extraordinaire. Each team member was greeted with a warm welcome and given a door prize for a special basket that Margaret made. Each guest was treated to a fantastic array of teas, coffees and sweets. This is a picture of Ria signing her door prize ticket and you can see the cute napkins that Margaret fancy folded for our tea. Again, I'm sorry I didn't take more pictures but you can just make out the gorgeous little cupcakes Margaret made as well. Kareen helped organize our show 'n' share area for the evening. Everyone brought amazing examples of things they had made this past month. Here are just a couple examples of the projects that were shared. We played a little game of "Do you know your Stampin' Up! Colours"
There was a lot of thinking going on here. Of course we did a few make 'n takes. It's always fun to learn new things. Sorry, Margaret but I had to share this next photo. Irv captured your look of "Oh, I get it now" beatifully. I personally think we could have a lot of fun inserting a thought bubble above this photo and filling it in. This whole night was so positive and giving. Our entire team is so generous. Everyone pitched in and helped with preparing things, helping fellow team members, sharing ideas, planning generous giving tasks. The whole room was filled with such a caring, loving spirit. Thank you all so much for being so positive and such giving and generous ladies. I am so blessed to know you all and call you my friends.